‘Fresh’ is this week’s Photo Challenge at WordPress and here are a few daffodils (from our front garden) which always put me in mind of Spring, season of fresh, new beginnings. I’m not feeling all that ‘new’ myself, after a busy few weeks at home and work. Reading at Uncut Poets in Exeter on Thursday, 26th March, 7.30pm. I will read from my pamphlet, ‘The Misplaced House’, and new work. Some time off work to dedicate myself to a sustained period of writing. I’m coming to the end of my 18 month contract with The Reader Organisation and I’ve decided to allow myself time away from paid work (perhaps until the end of this year) so that I can focus on completing a second poetry publication – maybe a second pamphlet, maybe a full collection. Time with my family. My children are growing fast! Now aged 14 and 15 and no longer children at all. I feel I’m living in golden time, we all seem to be getting on well and we enjoy each other’s company. As long as it’s like this, I want to make the most of it. After jotting down these things to look forward to, I feel less jaded than when I started this post. 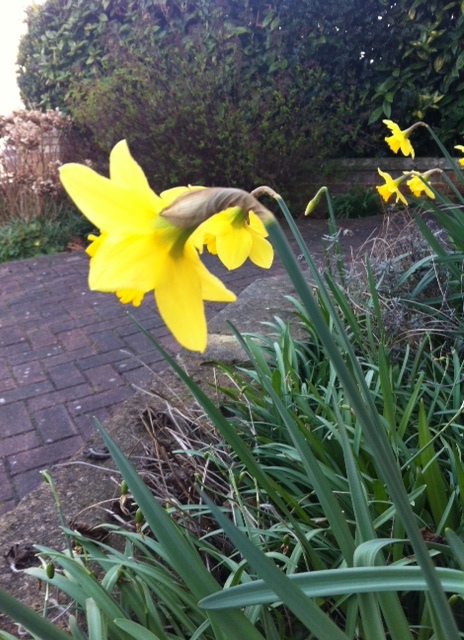 And it IS Spring, the daffodils HAVE appeared, the lambs ARE in the fields. Hope you have good things to look forward to. Head over to the weekly photo challenge for some other ‘fresh’ ideas.